Mayor Marc Coombs attended a news event at the Keeler Centre in Cramahe to recognize the important work CPN is doing for the community. In a press release (see below) Mayor Coombs commented that “this has been a longstanding desire…and it is certainly great to see them finally installed.” Keeler Centre is the fourth major solar project that CPN has built. Construction has begun on a new rooftop solar installation at the Keeler Centre in Colborne. On a sunny day, nine hundred and fifty two solar panels will produce enough electricity to power the equivalent of 40 homes — a total of 250 kilowatts of clean energy. Colborne now joins Hamilton Township (Baltimore) and Cobourg in having a major solar installation on at least one of their municipal buildings. 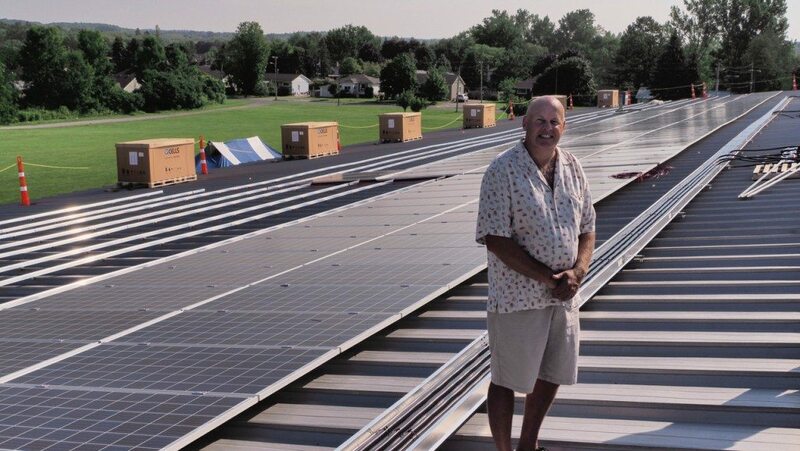 Colborne leases the Keeler Centre’s roof to Community Power Northumberland, a local volunteer renewable energy co-operative who is building and funding the project. Proceeds from sales of electricity are used by the cooperative to invest in sustainable initiatives throughout the county — from community gardens to cycling to working with charitable organizations. “This is a win/win scenario,” Tony Walker, president of the cooperative, says. “Colborne receives 20 years of rental income while the cooperative directs surpluses to renewable energy projects and sustainability initiatives.” Construction at the Keeler Centre should be completed by the end of August and certified by the province’s Independent Electricity System Operator sometime in September.